Are you using CRM to boost returns on healthcare marketing investments? Corrigan Partners has teamed up with our colleagues from Greystone.Net to host a Healthcare MarTech workshop on CRM as an essential tool for healthcare marketing. The one and a half day program – Customer Relationship Management: Making the Most of Your CRM Investment – will be held September 29 & 30, 2015 at the Catalyst Ranch in Chicago, Illinois. Customer Relationship Management (CRM) is a game-changing technology with the potential to transform healthcare marketing. With CRM you can more effectively focus marketing investments on the right customers, lower the expense of patient acquisition and retention, create loyal brand advocates and track return on investment. Yet, many healthcare organizations have struggled to make it work. This workshop is designed to address the decisions, capabilities and resources required to make CRM successful. How do I craft a vision and strategy for CRM in my health system? How do I pick the right CRM solution and vendor? What changes will I have to make in the marketing department? How can I ensure we’re getting the most out of our CRM system? How do I get my CRM strategy back on track? What can I learn about CRM from other industries? Healthcare marketing executives from around the country will join the Corrigan Partners and Greystone.Net faculty to share their CRM journeys, providing insights into the trials and successes of their CRM programs. Participants will leave with information and tools to support CRM selection, build effective vendor relationships and optimize performance of their CRM systems. In order to provide an intimate venue for open discussion and sharing of CRM expectations and experiences, space is limited to 30 health system (non-vendor) participants. Click here to learn more about the workshop, download the brochure and register to attend. 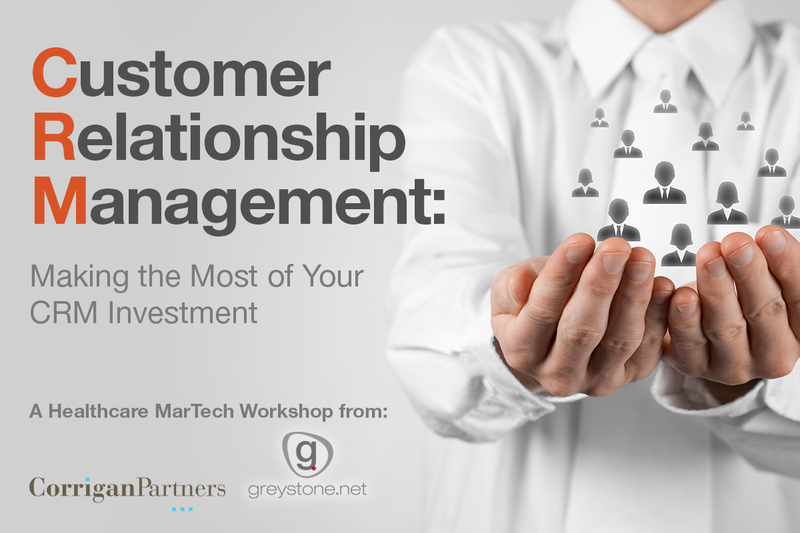 I’m thrilled to announce that Corrigan Partners has teamed up with our colleagues from Greystone.Net to host a Healthcare MarTech workshop on CRM as an essential tool for healthcare marketing. The one and a half day program – Customer Relationship Management: Making the Most of Your CRM Investment – will be held September 29 & 30, 2015 at the Catalyst Ranch in Chicago, Illinois. Healthcare marketing executives from around the country will join the Corrigan Partners and Greystone.Net faculty to share their CRM journeys, providing insights into the trials and successes of their CRM programs. 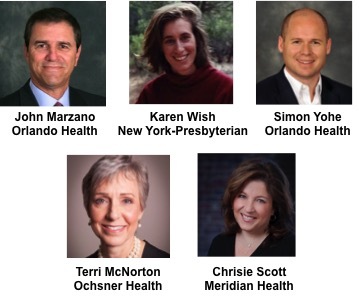 Learn from marketers at Ochsner Clinic, Orlando Health, Meridian Health System and others. In order to provide an intimate venue for open discussion and sharing of CRM expectations and experiences, space will be limited to 30 health system (non-vendor) participants. Registration fees are $795 before and $895 after July 15, 2015. Rooms have been reserved at the Crowne Plaza Chicago Metro (group rate $214/night). Click here to learn more about the workshop, download the brochure and register to attend.